Scented candles have been a thing since the 70s, though they've been around even longer than that. There is a boom to the industry as of late, when it comes to movie related candles in specialty shops. Especially popular are the Old Saint candles refurbished to include such deities as Freddy Krueger, Justin Bieber and Dolly Parton. Now, A24, the innovative movie studio that has brought us such acclaimed hits as Lady Bird, Eighth Grade, Hereditary and The Witch is taking it a step further. They have introduced their own line of genre scented candles. Yes, these are candles that smell like your favorite movie genre. Though comedy is suspiciously absent, only because we speculate that it smells like tears of sadness and the sweat of desperation. Instead, we get scented candles for Adventure, Horror, Thriller, Noir, Musicals and Westerns. The candles are meant to accompany your next at home movie party. So, if you're watching The Witch you definitely light up the horror candle, and it will presumably whisk you directly into that world. 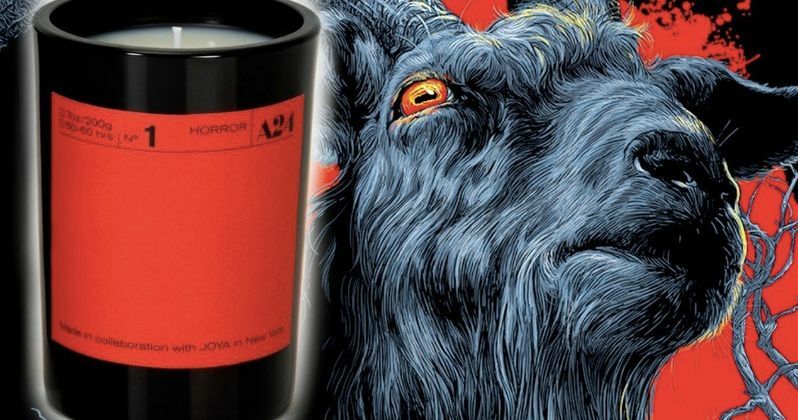 A24 is offering the different candles at just $48 dollars each, which sounds a bit expensive until you factor in the cost of a movie ticket. The candles contain 7 oz. of wax. And each candle is estimated to last through 33 viewings of your favorite movie of genre choice. The candles are currently on sale at A24's studio store. Each individual candle is color coded with its own unique scent. Geeky Rant has a break down of each scent, in case you want to know what some of your favorite movie genres smell like. They all sound quite delicious. First up is Musical, which lands in a soothing baby blue, with a scent that is described as 'dewy' and 'watery'. This particular candle is said to be quite lovely. The second candle is adventure and it comes in dirt brown. It's said to smell like hot sand and 'Mayan ruins', which will put you right in the mood for Indiana Jones, making you feel as though you were rolling around in the desert with Indy yourself. The third candle is Noir, and if you didn't guess it comes in black, well, then, perhaps these candles are not for you. This candle smells like 'rose jam' and is said to be 'a little spicy'. It is also described as being velvety and dark. The Thriller candle comes in dark cobalt blue, and it smells a bit smokey and Metallic. It's also described as 'roasted'. Perhaps a smoking gun comes to mind. This candle is perfect for watching Se7en for the umpteenth time. Horror comes in bright, poppy red. It brings about the aroma of leather. It's described as 'dank', not 'unsettling' but not 'settling' either. Finally we come to the Western candle, which arrives in a soft pastel pink, or maybe it's better described as lavender. Not exactly the color one thinks of when it comes to Westerns. The smell is described as 'sweet' and 'explosive'. The candle is also called 'jarring'. These scented Genre candles will make a unique and interesting Christmas gift, and they look like they will perfectly fit in any stocking. if you've been wanting to add something extra to your favorite movies, giving them a distinct smell sounds like an interesting way to do that. They'll certainly get you in the mood. Along with Comedy being left out of the genre mix this time around, there are also no Drama, Sci-Fi or Romance candles. So perhaps more are on their way. A24 could even start doing sub-genre candles with horror comedy or romantic comedy or even a Political thriller. The possibilities are endless.